EML to Outlook Transfer description. Best in class EML to PST converter. EML is a wide-spread e-mail message format seen in Outlook Express, Live Mail, The Bat and other clients. What about EML to Outlook conversion? This is possible, of course, but you hardly want to do this manually, especially if the amount of EML files is significant. 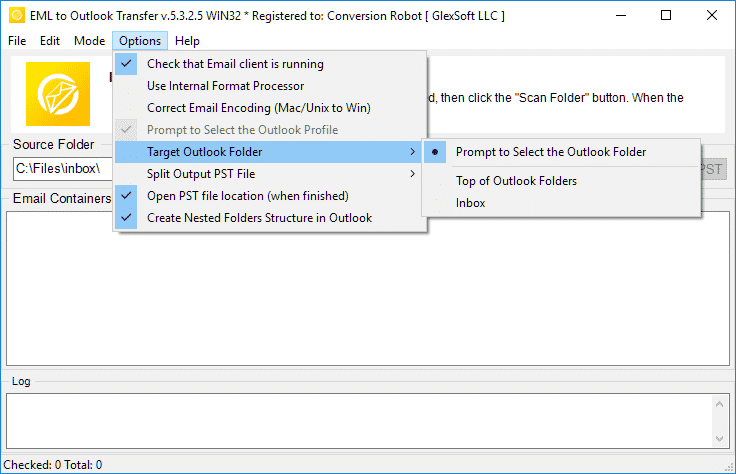 Now, there's EML to Outlook Transfer tool that automatically imports EML messages to PST format and providing one-click migration from other e-mail clients to MS Outlook. Yes, it's that easy. The program detects all necessary settings and performs transfer easy and safe. Data migration is a complex process involving the accurate extraction of the necessary objects and data sets, their conversion into the destination format and saving them to the user’s hard drive. Although the task may appear straightforward from the first glance, in reality, data conversion is a lot more sophisticated than that. Email conversion is used for transferring messages with attachments from one email application to another. One particular situation that requires email conversion is the migration from any email application supporting the *.eml format to MS Outlook. The latter only works with the proprietary PST format that stores all types of objects (emails, attachments, notes, tasks, contacts, and others) in a single file. When you need to transfer several years worth of emails and business or personal information stored in eml files, manual conversion becomes nearly impossible due to the sheer amount of data that needs to be carried over and the number of files the user needs to deal with. And this is when specialized conversion solutions like EML to Outlook Transfer tool come into play. 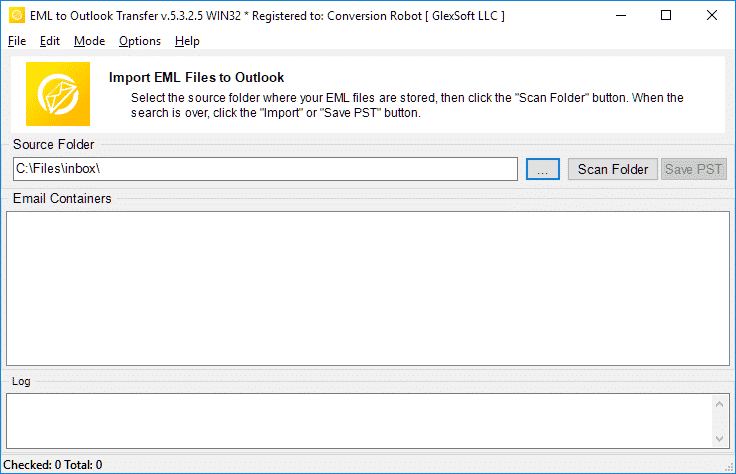 EML to Outlook Transfer is the one and only product you will need to convert email messages of nearly any type of EML format to Outlook and convert eml to pst format with a few clicks. 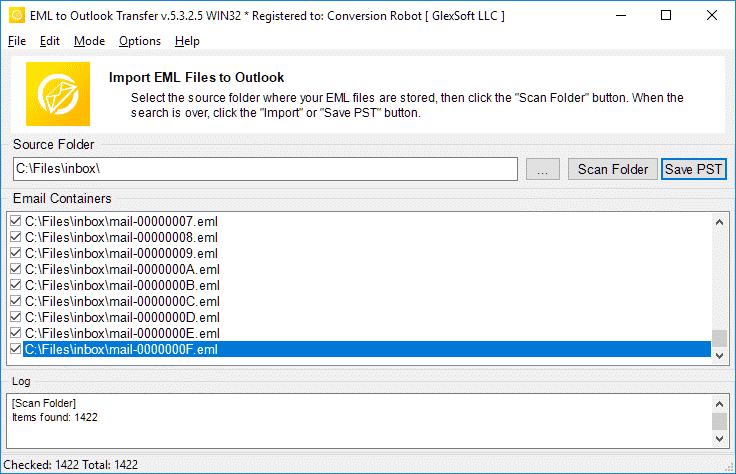 It allows to import eml to outlook and so open eml file to view, edit, reply or resend it using standard Outlook functions. EML to Outlook Transfer is the ultimate tool for quick and problem-free conversion of any number of EML messages to the PST format. Apart from EML to PST conversion, the program effortlessly handles other type of conversion – from EML to Outlook user profile. 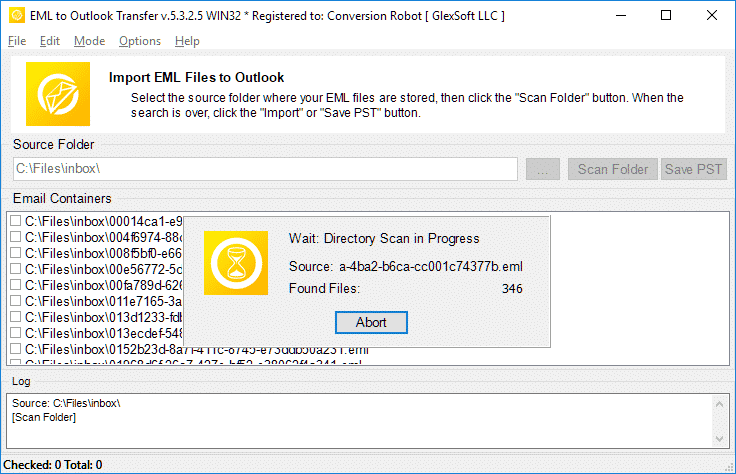 This provides users with plenty of .eml file conversion opportunities, allows to use Outlook as a eml viewer and gives them the flexibility to move data between formats and various applications. Moreover, the product is supplied with internal email converter that can be used for preparing the data of such email clients as Thunderbird for subsequent transfer to Outlook via the intermediate EML format or manipulating them otherwise. Thanks to its extremely straightforward wizard-based user interface, the program can be used even by novices trying to deal with email conversion on their own. No matter what you need to do, convert eml to pst or import eml to Outlook, the tool will handle these tasks easily. Upgrade from one version of Windows to another that no longer supports the previously used eml file format. Upgrading from Windows Vista to Windows 8 is a good example – Windows Mail was removed from Windows 7 that offered Outlook as an option. You do not need special eml viever to open eml file, you have to import eml to Outlook and use it for that. In this case, a proper EML to PST conversion tool is a must-have. Upgrade from Outlook Express to the much more powerful and functional MS Outlook – a standard email application used in companies across the globe. Unfortunately, there is no standard email migration tool provided by Microsoft, and users are forced to resort to third-party solutions like EML to Outlook Transfer. Data recovery from a damaged email database or file of any format that produced a bunch of EML message files than need to be assembled back into a healthy PST storage file. This is one of the most common scenarios that requires a reliable data recovery procedure and tools. With Outlook Transfer tool you may simple convert eml to pst back after using recovery software. The program is the optimal choice for one-time or regular email transfers from Live Mail to MS Outlook. Thanks to a convenient user interface and a powerful engine, the complex email migration task becomes a matter of a few mouse clicks and something that even a fifth-grader can handle with ease, even without knowing how to convert data. Ultimately fast, reliable and intuitive, it’s an end-to-end solution for the problem of email migration. 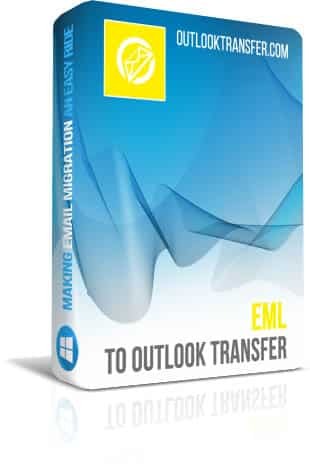 E If you are in a situation that requires some emails to be converted right away or your job responsibilities make you deal with this task on a regular basis, EML to Outlook Transfer will serve you a good service! No file will remain unreadable, no message will be missed or appear unreadable in your inbox after conversion – the program will take care of your migration problem and save you a great deal of time and effort. Your comments, suggestions or ideas will be very valuable as we do not stop to make improvements to our software. Please feel free to post your rating and review about EML to Outlook Transfer product using the button below. We really appreciate your feedbacks. Thank you very much. The product has been very helpful. I have been successful in importing all eml-Mails in Outlook (thus finally overcoming the Outlook-Express and LiveMail-past). I exporting files from a Barracuda Archiver and could not get it to export to pst but could get it to export to eml. Barracuda was closed for help and I did not want to wait till next day and bought your software to convert eml to pst. It helped me quickly. Thank you. Easy to use and cheap! I've maintained email accounts across several email clients and wanted to consolidate everything to Microsoft Outlook. It's truly a pain trying to manage email messages across multiple email clients without your the EML to Outlook Transfer tool. Easy to use and cheap. It does everything I want. Great job! Additionally thanks for support. I thought i had a nasty and long task ahead of me, (3000 e-mails individually saved as .eml), but this simple tool did the job quite well! No complications, no fuss; Just open outlook, run the application and you’re done. Recommended! The tool is just good enough to be in my software collection. It is accurate and fast and easy to use EML to PST converter which works as described. Unfortunately the GUI is English only, so it is receiving 4 stars from me. I used your product to import .eml files pre-saved from Outlook Express to Microsoft Outlook. I was surprized to see that your tool is capable to handle also the folders structure. 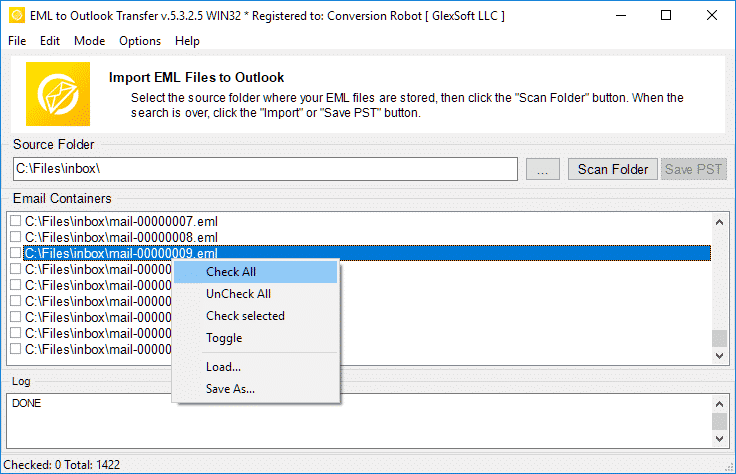 EML to Outlook Transfer software is really perfect solution for eml to pst conversion especially for those who have 64-bit Outlook edition as this is only tool that can handle this also.